Happy July 1st you all! Can you believe July is here? Summer is going way too fast! I hope you have been having a busy one. So far ours has been pretty busy and fun. Now the rain in PA has been a little over the top – but besides that, not too bad. To start July with a bang – How about a free printable? 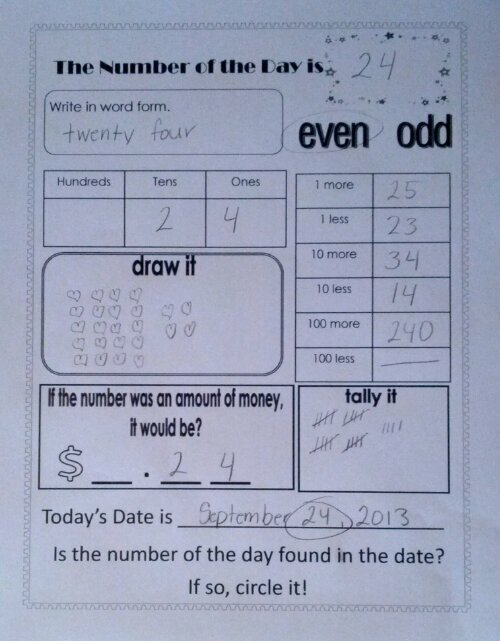 Here is a number of the day sheet that would be fun morning work for grades 1-2. When I taught Everyday Math we always worked with the number of the day, seeing how many different ways we could display it. This worksheet stems from that. If you LOVE it – please take a moment to leave positive feedback here. Thank you – I appreciate it! Need back to school ideas – click here! Earn Free Printables if We Win!!! !